Instead of concentrating on going thru the list of The 100 Greatest Movies, I paid a visit to my local Blockbusters this weekend. 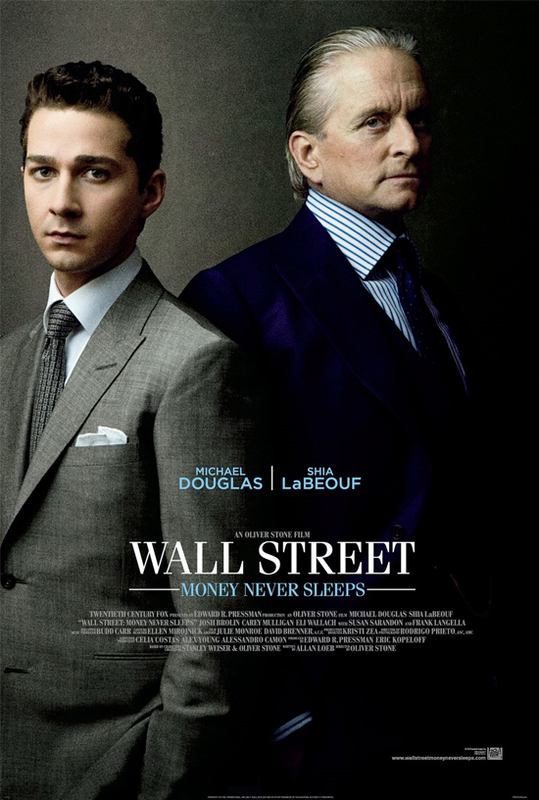 As Social Network was not out yet – I am dying to see that after I missed it at the movie theatre – I ended up getting Wall Street: Money Never Sleeps. This is a sequel to the 1987 Oliver Stone film Wall Street, which I saw a long time ago. And obviously have forgotten that I possibly did not understand most of it. In any case, this is exactly what happened with WS: Money Never Sleeps – I lost the plot several times. Graphs of stock markets, stock market jargon and the trading business just made me dazed and confused. There were several scenes in dark boardrooms with bankers discussing the banking crisis in length. Yawn! The movie is over two hours long – too long if you ask me. This would be fine if there would be a nice and meaty sub-plot with two-dimensional characters, but I have to say that after forty-five minutes I did not really care what was going to happen to Shia La Beouf’s and Carey Mulligan’s characters. Nor who caused the boss of SLB’s character to jump in front of a train. Painting by numbers – anyone? Instead I spent most of the movie concentrating on my “apartment envy” directed towards the fabulous apartment where Jake Moore (Shia La Beouf) lives with his girlfriend Winnie Gekko (Carey Mulligan), who also is Gordon Gekko’s (Michael Douglas) estranged daughter. And – in my mind – redecorating that apartment! Gordon Gekko’s rented apartment was not bad either! Gordon Gekko is a ruthless and sinister man – this is clear from the beginning of the movie. He is using Jake Moore to get revenge on the person who testified against him back in Wall Street. This person just happens to be the same one who caused Jake’s boss and mentor to commit suicide. Jake is more than happy to make him pay; but as he is playing with the Devil (Gekko); Jake gets into more trouble than he bargained for. This is as far as the plot stretches. The sub-plot deals mostly with father issues – obviously both Jacob and Winnie have plenty of those. For an Oliver Stone movie, I was expecting the screenplay to be more interesting / controversial – something that could hold my attention even if the “financial crisis” aspect of the movie would not. Boy, was I disappointed! All the actors did a good job; but it felt as if the characters were not explored deeply enough. Even Gordon Gekko seemed to be lacking punch, which he did have in the first movie. Though Michael Douglas as Gordon Gekko is still devilishly cunning. WS: Money Never Sleeps has nice cinematography and great camera angles. But even that cannot save this movie from being boring and lacking any controversial approach. It also does not have great one-liners like the first one. Once again, it is proven that very seldom sequels do actually rise to the level of the original movie.